Kristine Nielsen and Mark Linn-Baker are oddballs who live under a strange roof in "You Can't Take It With You." Photos by Joan Marcus. LONG before the sitcom came into everyone's living room, there was a great American comedy deeply ingrained in theatrical tradition. "You Can't Take It With You," in a beautifully staged and spectacular revival at the Longacre Theatre through 4 Jan. 2015, is a bright and shining part of that heritage. "#YCTIWY," as it is widely advertised, is George S. Kaufman and Moss Hart's Pulitzer-winning play, written in 1936 and first produced at the Booth Theatre from December of that year until December 1938. The show has been on Broadway stages often over the years since, most recently in 1983. As reincarnated here with a gorgeous set by David Rockwell and under the expert guidance of Scott Ellis, "#YCTIWY" is as sparkly and modern a rom-com as any seen in years. (See video below). 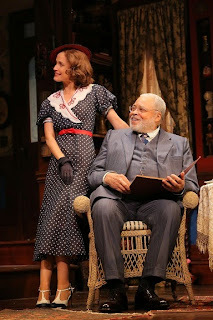 Rose Byrne is the face of normalcy and James Earl Jones is the indulging patriarch in "You Can't Take It With You." 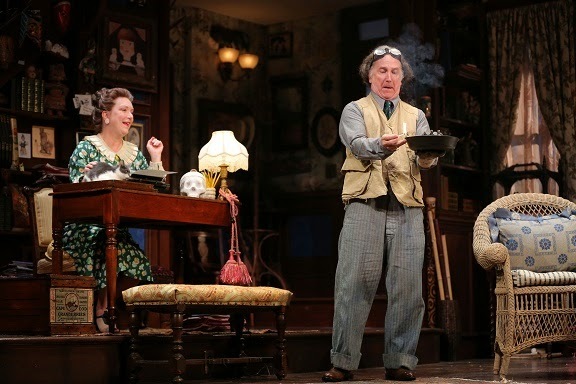 The Sycamores, mother Penny (Kristine Nielsen), father Paul (Mark Linn-Baker), daughter Essie (Annaleigh Ashford) and her husband, Ed Carmichael (Will Brill), live under Penny's father's beneficent roof. Grandpa is Martin Vanderhof (James Earl Jones) who indulges all their eccentricities and has some of his own. The household is regulated by the family's maid, Rheba (Crystal A. Dickinson) and her live-in beau, Donald (Marc Damon Johnson.) Only Alice Sycamore (Rose Byrne) seems immune from the unconventional. Unlike the rest of the gathered brood, she holds an ordinary job as a secretary at a Wall Street firm. There, she and the boss's son, Tony (Fran Kranz), have fallen in love. When Tony's straitlaced parents, Anthony Kirby, Sr. (Byron Jennings) and his wife and Tony's mother, Miriam (Johanna Day), drop in for dinner the antics of the Sycamore extended clan threaten Alice and Tony's happiness. Rounding out the assembled visitors and residents is Olga (Elizabeth Ashley), Kolenkhov's friend and a grand duchess. 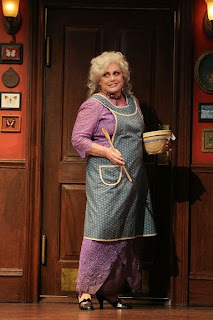 She drops by to make blintzes and add to the madcap. An IRS agent named Henderson (Karl Kenzler) also stops in, along with a few Justice Department chaps (Nick Corley, Austin Durant and Joe Tapper). Elizabeth Ashley is a grand lady with a recipe in "You Can't Take It With You." The performances in "You Can't Take It With You" are universally grand. RR and EA provide the over-the-top and slapstick elements. JEJ, especially, gives an affecting and subtle performance as the patriarch. RB and FK are charming lovers. The teamwork on display in this brilliant ensemble is wonderful to watch.